Chicken pot pie is comfort food personified. Boneless chicken and diced up vegetables are cooked in a rich and creamy white sauce with a bit of spice to give it that Desi kick. Hot out of the oven with flaky puff pastry on top. 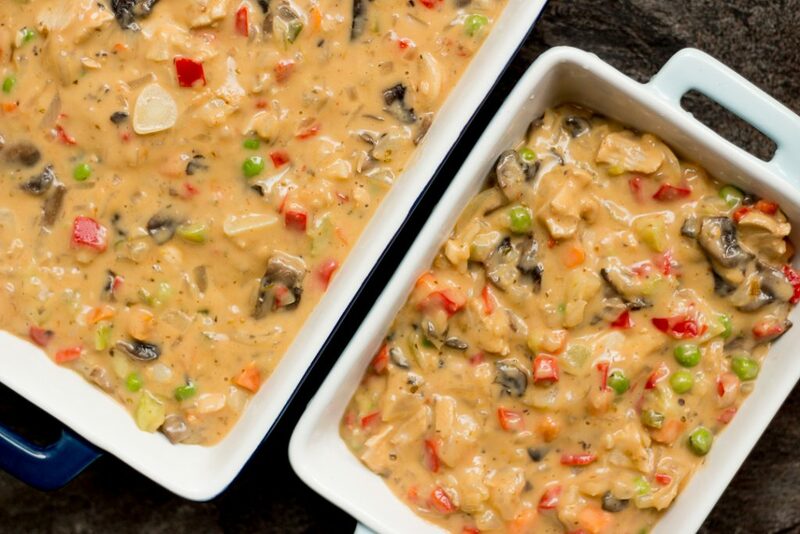 It’s diced chicken and vegetables combined together in a creamy white sauce and poured in a large baking dish. Topped with a puff pastry crust, and then baked in the oven till the top is golden brown and the filling is bubbling from inside. 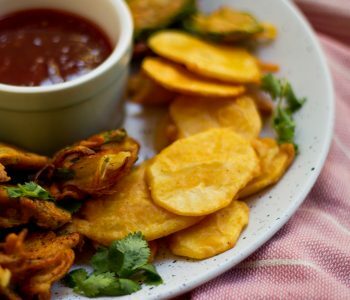 Its classic comfort food, best suited for the colder months but honestly something I can have year round. 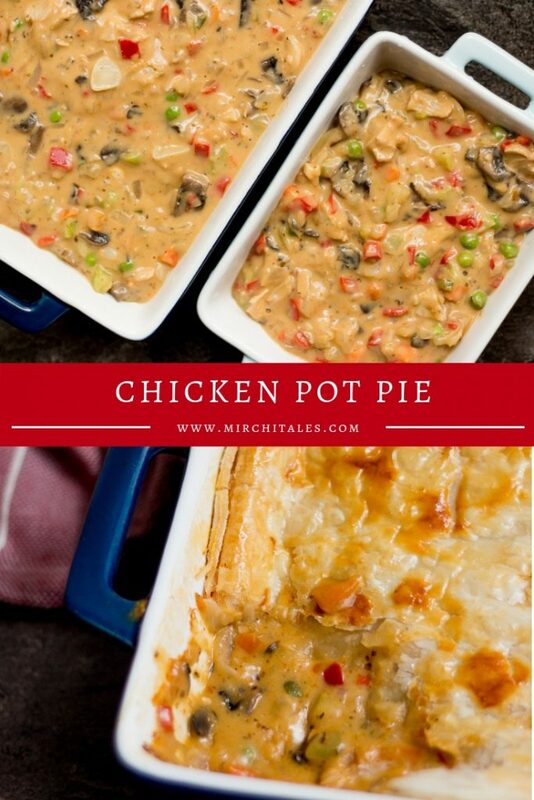 How to make chicken pot pie? Start off with sautéing chicken and vegetables with garlic in butter. Season with salt and pepper. Add more butter and make a roux (white sauce) with milk and chicken stock. Let it thicken, and season once again, this time with herbs and red chili flakes. I tend to use a ratio of 1 cup meat to 3 cups of vegetables, and about 3 cups of liquid, half milk and half chicken stock. I usually make it from scratch, but I have made a jhatphat chicken pot pie using whatever leftovers I have in the fridge. Leftover chicken boti from chicken salan (just wash the masala off and use), half an onion, half a capsicum, some frozen vegetables, quick white sauce and just puff pastry on top. It’s a great way to use up leftovers! It’s best to let the chicken pot pie sit for 5 – 10 minutes so that the filling can settle, else it can be too runny. But if you are in a hurry, and I can’t blame you if you aren’t because the smell that wafts through the house when this chicken pot pie is out of the oven is sensational, just serve with garlic bread on the side. Use it to soak up all that delicious filling! Chicken pot pie is comfort food personified. 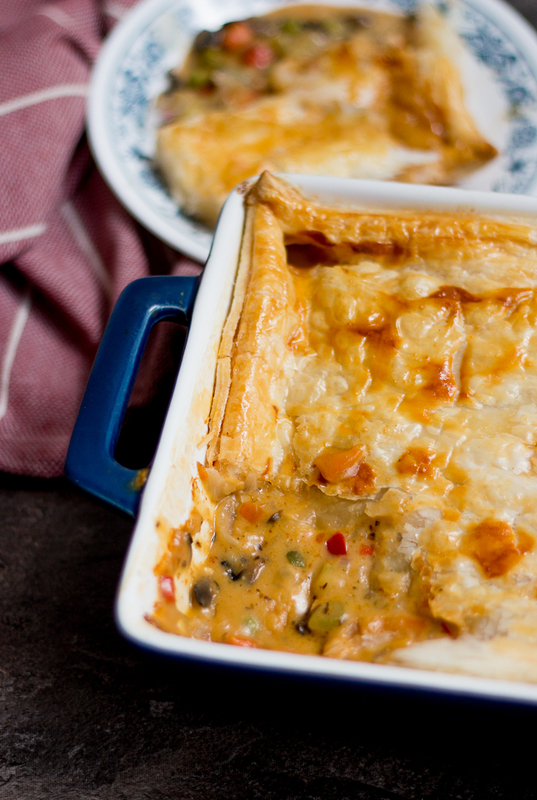 Chicken and vegetables in a rich and creamy white sauce with flaky puff pastry on top. Delicious! Heat 2 tablespoons butter tablespoons in a large pot. Add sliced garlic and saute for a minute till flavour gets released, and then add the diced onions and green chilies. Saute till the onions are translucent, and then add mushrooms. Cook the mushrooms for 2 minutes, and then add chicken. Cook the chicken till it changes colour from pink to white, and add sliced capsicum. Cook for a minute and add the mixed frozen vegetables. Saute for a minute and then add the remaining 2 tablespoons butter. Add flour and cook for about 1 – 2 minutes till the raw flavour disappears. Make sure to mix well with a spatula, so the flour doesn’t clump. Add the milk and chicken stock, and bring to a boil while stirring constantly. It’s best not to add all the milk and chicken stock at once. Reserve about ½ cup to adjust consistency. As the sauce comes to a boil, it will start to thicken. Add salt, Italian herbs, soy sauce, sriracha sauce, black pepper, white pepper and red chili powder or flakes. Taste and adjust seasonings if required. Pour the chicken pot pie filling into one large baking dish or two smaller dishes. This amount of filling was enough for one large baking dish (36 cm x 22 cm) and one small baking dish (22 cm x 13.5 cm). Roll out puff pastry if using a block of puff pastry, otherwise thaw a puff pastry sheet for a few minutes. Cover the baking dish with puff pastry. Cut slits with in the middle and edges. Decorate with leftover pastry scraps and/or crimp the edges with a fork. Make an egg wash by beating an egg with a fork in a small bowl. Use a pastry brush to spread the egg wash on the puff pastry. Bake in the oven till puff pastry is golden brown and the chicken pot pie is bubbling hot. 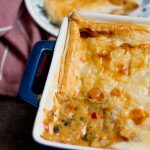 This can take anywhere from 15 – 30 minutes, depending on the size of the baking dish used as well as the puff pastry brand. 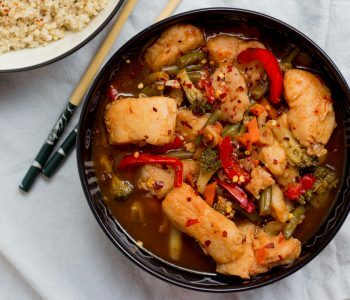 This particular recipe calls for 3 cups of vegetables and 1 cup of boneless chicken, but the ratio and variety of vegetables used depends on personal preference. Vegetables that work well in a chicken pot pie are carrots, green beans, peas, corn, celery, capsicum, and broccoli. Go for firm vegetables that will retain crunch and flavour when baked, and avoid soft vegetables like tomatoes. 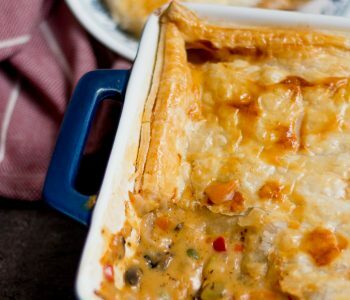 The liquid ratio can also be adjusted to make the chicken pot pie lighter or creamier. In order to make the chicken pot pie creamier, add more milk to chicken stock. If you want it more decadent, add ½ cup a cup of cream reducing the amount of chicken stock accordingly.